The first settlers arrived in the Newburgh area of Western Wayne County around 1825 after the Revolutionary War looking for new land to cultivate. One of these settlers was Salmon Kingsley, a Revolutionary War veteran. He died about two years later and was the first person buried in this land, which would later become known as Newburgh Cemetery. 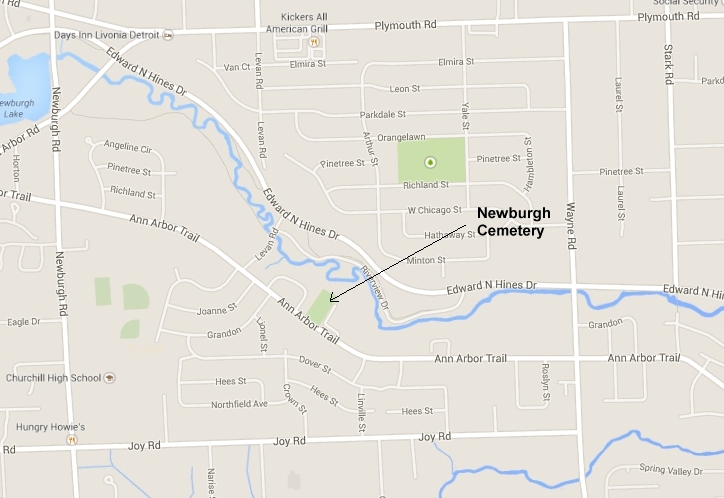 In 1832 an organization, which later became known as the Newburgh Union Cemetery Society, was created to establish and maintain this cemetery, the first in the present day city of Livonia. The cemetery was listed on the State of Michigan Registry of Historic Sites on January 24, 1964 and the State of Michigan Historic Marker was placed on April 17, 1964. Those who established the Newburgh Union Cemetery Society purchased additional land such that Newburgh Cemetery now encompasses 2.35 acres. Salmon Kingsley's son, Joseph Kinsgley, provided some of the land for the cemetery. 31 members of the Society donated the money needed for the cemetery property, lumber, labor, and other materials. Individuals donated monies ranging from 25 cents to 1 dollar, totalling $11.84, With the addition of donated labor , lumber, nails, gate hangings, and a hook for the gate, the total monetary value of donations was $41.90. The records of this Newburgh Union Cemetery Society are kept in an 8x12 inch ledger, which is in the possession of the Livonia Historical Society, Michigan Historical Collection in Lansing, Michigan. It contains a plot of the cemetery, together with minutes of all the meetings held from 1832 to 1923. The first officers of the Union Society of Nankin were: Luther Dean, president; Samuel Ely and George Durfee, trustees; William B. Dean treasurer; and Ebenezer Smith, secretary. The Society held its first meeting in a log cabin schoolhouse, now known as Newburgh School. They named their society and it's purpose as follows: " .. this shall be called the Union Society of Nankin, the object of which shall be to procure and enclose a suitable site for interment." The price of a lot was set at 50 cents, and also entitled the lot owner voting privileges. Many of the burials are that of members of the Newburgh Methodist Church which is about 1/4 mile west of	the cemetery. The cemetery holds approximately 4 veterans of the Revolutionary War, 50 veterans of the Civil War 4 veterans of WW I, 1 Veteran of WW II and 1 Veteran of the Korean War. The Village of Newburgh became part of Livonia when it became a city in the 1950's.